Mervin Smucker | Mervin Smucker Ph.D. The concurrent presence of PTSD symptomatology and pervasive maladaptive schemata in childhood sexual abuse survivors raises important clinical issues for conceptualization and treatment. Although a number of theories have been offered to explain posttraumatic symptoms in individuals traumatized as adults, an expanded information-processing model which addresses underlying cognitive schemata as well as intrusive aspects of the posttraumatic syndrome could significantly broaden our understanding of adult survivors of childhood sexual abuse and enhance the development of more effective treatment strategies with this “therapy-resistant” population. If the “meanings” of childhood abuse trauma are reconceptualized to include early-acquired, ingrained schemata which influence subsequent perceptions and behavior (for one such schema-focused approach, see McCann & Pearlman, 1990b), current theories and therapies which focus on early maladaptive schemas might be readily integrated into an information-processing model similar to that proposed by Foa and Kozak (1986). & Kozak, 1986; Foa, Steketee, & Olasov-Rothbaum, 1989; Lang, 1977,1979, 1986; Rachman, 1980). memory consisting of stimuli, responses, and the meaning assigned to the stimulus and response data. 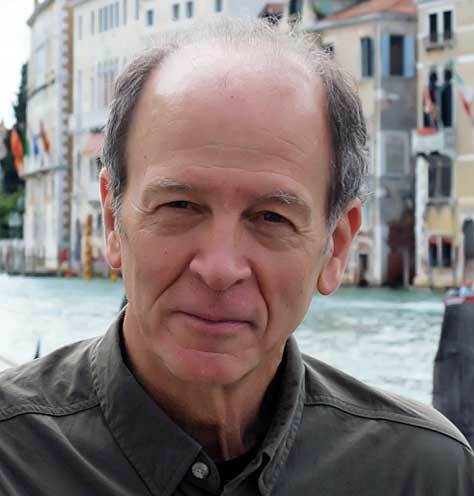 Lang contends that vivid response imagery is critical in accessing a fear memory and that affective involvement must be present in order for the memory unit to be altered. A standardized intelligence test, the SRA Short Test of Educational Ability, was given to a large sample of Amish and non-Amish school-aged children (grades four through eight) in rural Pennsylvania to determine whether cultural differences existed between these two groups. Due to the nature of the intelligence test, which was comprised of 60% vocabulary questions and 40% arithmetic questions, the Amish children were probably at a disadvantage, since nearly all of them had learned English as a second language. As expected, the Amish intelligence scores were lower and more homogeneous than those of their non-Amish counterparts. However, the Amish intelligence quotient scores were consistent with the national mean for same-aged children. In addition, the scores of the Amish children increased slightly from one grade to the next, with the eighth grade scores being the highest. Upsetting memories and the images that derive from them have a powerful effect upon an individual’s mood state. Although mental imagery may have several different functions, some researchers believe that one function of mental imagery is a type of mental representation that serves to represent information about an individual’s goals – a kind of language of goals relating either to the future (e.g., with social anxiety) or to the processing of past events (e.g., as in posttraumatic stress). Mental imagery is also linked directly to emotion that can both maintain dysfunctional psychological states and thus act as a defense against goal change; conversely the generation of positive imagery can play a critical role in actively resolving distressing emotional states that lead to the formation of new more adaptive goals. Mervin Smucker. From Imagery Substitution to Imagery Rescripting: Therapeutic Applications of Imagery from Janet’s 19th Century Laboratory to 21st Centure CBT Clinical Practice. Since the mid-1990s, the use of imagery in CBT treatments has become more commonplace, especially as a means of treating PTSD and other anxiety disorders. However, the use of imagery as a therapeutic agent is actually not a recent discovery, but has a long history that parallels the development of psychotherapy itself and shows up in the early works of Janet, Charcot, Freud, and Jung. Later Reichian and Gestalt Therapists also made use of imagery in ways that created a powerful experience for clients, but which were difficult to integrate within an academic framework. What is new about the emerging approach to imagery in the past decade or so is the use of CBT as a framework for theoretically integrating linguistic techniques with imagery interventions. This visual-verbal cognitive interface is reflected in Beck’s early writings in which he contended that images were “visual cognitions” subject to examination and modification just as verbal cognitions are. This talk examines the historical roots of imagery rescripting interventions in psychotherapy, and discusses how an expanded cognitive model has “liberated” CBT therapists to use imagery-based interventions in a scientific manner and to empirically validate their imagery treatments. Imagery Rescripting & Reprocessing Therapy, the first and still the only manualized CBT Imagery-based treatment, is presented as an outgrowth of this historical framework, especially in the context of Beck’s developing work with imagery modification as part of his cognitive therapy model. In particular, this address emphasizes refinements of both the imagistic and linguistic elements of IRRT— the use of skillful questioning, Socratic rather than guided imagery, and the importance of having the patient take the lead in the process of transforming traumatic imagery to adaptive imagery. Mervin Smucker. Where Do Negative Thoughts and Thinking Errors Come from? People tend to have an abundance of negative thoughts that are based on distorted thinking. According to cognitive therapy, as developed by Professor A.T. Beck (Beck et. al., 1979), negative automatic thoughts and cognitive distortions originate from underlying assumptions and schemas about ourselves and our world. These underlying beliefs predispose us to becoming emotionally distraught (e.g., anxious, depressed) during stressful times and often activate our negative thinking about personal worth or what is important to us in life. For example, if I believe that, Unless I am liked by everyone, my life is meaningless, or If I do not succeed at everything I undertake, I am a failure, then I am vulnerable to being overwhelmed with negative automatic thoughts as soon as these beliefs are activated by stressful events (e.g., if I am disliked by someone, or if I fail at something I attempt). A critical goal of cognitive therapy is to recognize, challenge, and modify specific underlying assumptions that predispose people to depression and anxiety in times of stress. Mervin Smucker. 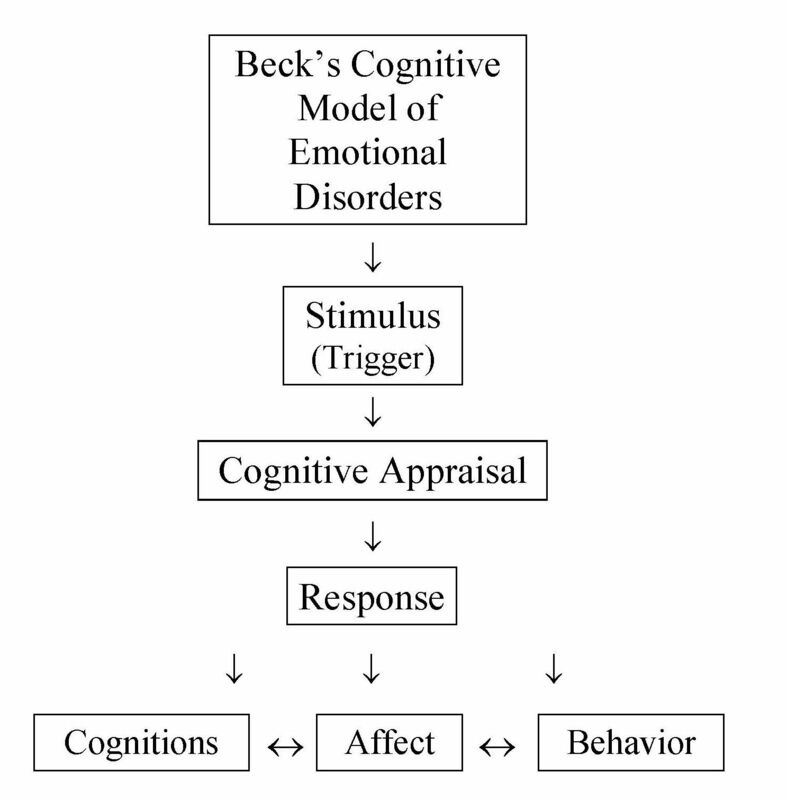 Brief Diagram of Aaron T. Beck’s Cognitive Model of Emotional Disorders. Mervin Smucker. The Use of Imagery in CBT to Promote Therapeutic Change. The use of imagery interventions in CBT has been an emerging topic among CBT theorists and clinicians in recent years. Clinicians are finding that intrusive, affect-laden images can contribute to significant distress in a variety of psychological disorders, and that using imagery interventions directly on upsetting images can be a powerful approach that leads to alleviation of emotional distress. Research has found that emotional memory tends to be visual in nature, and conversely, mental imagery is generally more emotional than verbal processing of the same material. As such, directly challenging and modifying distressing images appears to be a powerful means of promoting emotional change. In recent years, a number of different CBT treatments have emerged that use imagery to promote change with a range of anxiety disorders, depression, and personality disorders. Mervin Smucker (2016). The Hero’s Journey. Joseph Campbell (1904-1987) popularized the idea that cultural myths are relevant to interpreting our contemporary lives. A study of myths across the globe from multiple cultural contexts formed the basis for his key work, The Hero with a Thousand Faces (1949, 2nd edition 1968). Campbell suggested that the hero’s journey could be useful to moderns as they seek a way of making sense of their lives. He believed that the myth came from something deeper in the human psyche and crossed cultural divides. Form his study of myths worldwide, he described a hero monomyth. Star Wars and Indiana Jones film creator George Lucas borrowed from Campbell’s description of the hero monomyth—popularized at the Hero’s Journey—to create enormously popular films. Mervin Smucker,(2013). Replacing Recurring Distressing Imagery with Coping Compassionate Imagery. The presence of recurring, upsetting images and associated negative affect is a disturbing phenomenon that individuals are frequently confronted with following distressing, traumatic events especially from childhood. However, with the skillful application of imagery rescripting interventions, an individual can learn to modify and transform many of these distressing images and related traumagenic beliefs (such as, of powerlessness, unloveability, incompetence) into coping, mastery and compassionate-laden imagery. These imagery rescripting interventions combine imaginal reliving (visually recalling and re-experiencing the upsetting images along with related thoughts and feelings) with imagery rescripting (replacing the distressing imagery with mastery imagery) and self-nurturing imagery (visualizing oneself today compassionately nurturing, soothing and calming one’s traumatized or CHILD self back then). The use of imagery allows these negative, upsetting images to be visually activated through the eyes of the traumatized self back then, and challenged, modified, and reprocessed through the eyes of the empowered adult self today. Mervin Smucker (2016). Mindfulness and Psychotherapy. Mindfulness, a term from contemporary Buddhist writers such as Thich Nhat Hanh, has become popular in contemporary psychotherapy. Another term for mindfulness is awareness. However, rather than focusing on awareness as a means to an end—such as an insight or a conclusion—mindfulness emphasizes a state of being aware in the present moment in a non-judgmental way. Thus the practice of mindfulness can help a person become calm, receptive, and less attached to certain habits of mind and painful emotional states involving fear, anxiety, depression. In this manner, mindfulness can be a useful tool in facilitating therapeutic work, creating a non-judgmental, “neutral” mental state from which to observe one’s own habitual responses of thought and feeling.